My church is in the process of building a community resource center, which we will use as our meeting place on Sundays. We also hope to make it a place used by our community, which will include preschool and kindergarten programs. Every preschool or kindergarten program needs books! As we’re in the process of building, I’m going to slowly make a list of high quality books that I think our church should purchase to have in the classrooms. I’ll break the lists into three categories — one for preschool, one for Kindergarten, and one for specifically Christian books. There will definitely be some overlap, but this will be based on how I think of them. I’m a little sorry that the “Christian” category won’t be very large. I get books from the public library and don’t encounter as many books for Christians. But I’m starting this page off having just reviewed a wonderful picture book about the life of Jesus, so that will be my first book to post. I’m going to build these lists slowly, adding to them little by little. If you have suggestions, use this post. I’ll keep the list updated on my new Sondy’s Selections page. 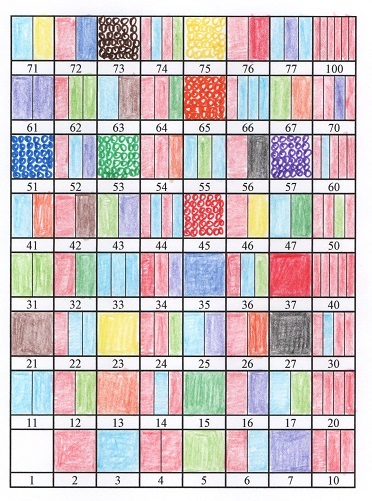 My previous Sondy’s Selections posts and page were my personal top ten lists of books for different age ranges. This new list will be my ideal collection of books for a church preschool and kindergarten. Now, I personally am not completely crazy about the book, since I have my own conception of Jesus’ story, and there’s some necessary simplification. For example, he gives Andrew’s lines to Peter (the only disciple named in this book, besides Judas) in the story of the feeding of the five thousand. But the more I look at this book, the more it’s growing on me. John Hendrix makes the characters in the story look like Jews. Jesus looks tough, and his clothes are a little ragged. But the most interesting feature is that he makes the words of Jesus part of the art and larger than life. The story goes on with the feeding of the five thousand and Jesus walking on the water, including Peter walking on the water. (“Peter, have faith in my feet, not your own.”) Then we come to the Last Supper and Judas’ betrayal. I haven’t seen another book about Jesus’ life quite like this one. The word that comes to mind is Majestic. The Author’s Note at the back explains why John Hendrix wanted to tell this story. I liked hearing that he was fascinated as a child by the words of Jesus in red in his Bible. You may have heard about the life of Jesus many times before, but my hope is to share the familiar story with you in a new way. Perhaps the best way to experience the Easter story is to momentarily forget about the trappings of religion around it and see the man at the center. In my experience, the story changes when we think of the people who experienced Jesus in person during the time he walked among us. Those people didn’t have a steepled church building or know anything about Christian theology. They simply met a man, some of them for only a brief moment, and they were changed forever. 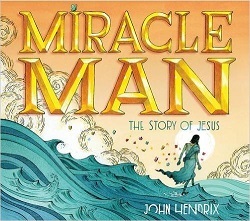 Most of all, the author’s love for the Miracle Man shines through. This book is a wonderful way to tell children about Him. It’s time for Sonderling Sunday! That time of the week when I play with language by looking at the German translation of children’s books, creating a Very Silly Phrasebook for Travelers. 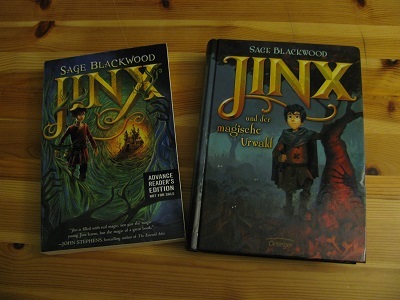 This week, let’s go back to Jinx, by Sage Blackwood, known in German as Jinx und der magische Urwald. We’ll look at interesting phrases and how they are translated. My sister’s visiting Germany this week, so bonus points to her if she can think of ways to use these phrases. = So kam es, dass Jinx bei einem möglicherweise bösen Zauberer und seinen siebenundzwanzig Katzen einzog, in ein großes Haus aus Stein, das einsam auf einer Lichtung stand, beschützt von unsichtbaren Wachen, die Monster fernhielten, einige sehr merkwürdige Besucher jedoch einließen. = Jinx ärgerte sich über den Spott. = Schlag dir diesen Unsinn aus dem Kopf. “How darling!” = Wie reizend! Now isn’t it lovely to have one word for this? = Er sah gefrorene Spuren von Füßen, Hufen und Tatzen im Matsch. = Simon funkelte ihn ärgerlich an. And that’s it for Chapter Two! I hope things won’t get immer schlimmer and you won’t encounter any flaschenförmigen Schreckensklecks. But now if you see a Schaumschnurrbart, you’ll know what to call it. Listening Library, 2015. 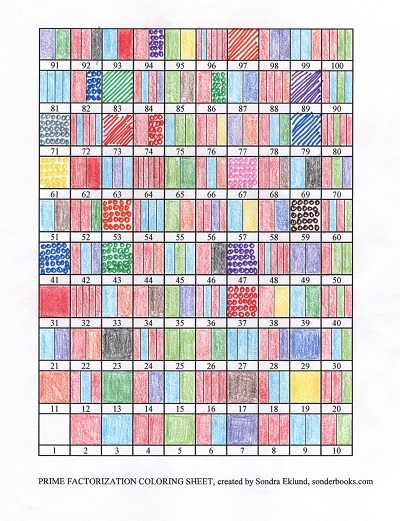 7.5 hours on 6 compact discs. I always try to listen to the Odyssey Award winner, since it is given to the best children’s or young adult audiobook of the year. 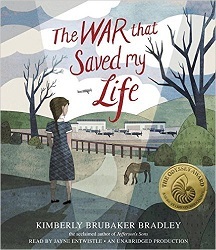 This year, the winner was also a Newbery Honor book and a Schneider Family Award winner, so I already knew it was something special. First, I got to listen to Echo, which was also a Newbery Honor book but the only Odyssey Honor audiobook. It was so good, it was hard to imagine an audiobook being chosen above it. Even with that much build-up, when I listened to The War that Saved my Life, I was not at all disappointed. 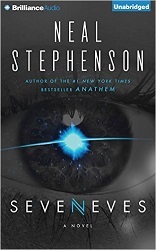 This was one of the few audiobooks that, when I got to the last CD, I brought the book into the house to finish listening, rather than wait until the morning and my next trip to work. It was way too good to wait! I should say a word about the narrator, Jayne Entwistle. I’ve listened to other books she’s read, The Scandalous Sisterhood of Prickwillow Place and >As Chimney Sweepers Come to Dust. I always enjoy her distinctive voice. Now, I do enjoy almost all English accents, but Jayne Entwistle does an excellent precocious little girl. And she does a fine job making the voices of the various characters distinctive. In this case, she didn’t need to do as many voices as in The Scandalous Sisterhood, and she put just the right character into each of the voices she did portray. The story in The War that Saved my Life is heart-wrenching. The story is told by Ada Smith. She’s got a club foot, though at the beginning of the book, she doesn’t know that’s what it’s called. She only knows that her foot is disgusting, according to her Mam, and she’s not to let anyone see her. She must stay in their one-room apartment in London. It’s bearable for Ada when she has her little brother Jamie to watch over. But as Jamie’s getting old enough to go to school, he’s also old enough to start playing outside. Ada’s heart is torn being alone in the apartment. So she decides to teach herself to walk. Not long after, they learn that London children are going to be evacuated to the country because bombs will be coming from Hitler. Mam hasn’t decided if she’ll send Jamie. Ada asks about herself. All of that happens in the first two chapters. But Ada decides then and there that she will leave with Jamie. Her Mam doesn’t know she can walk, and Ada steals Mam’s shoes and sneaks out with Jamie to get there early on the day the children are evacuated. Once they’re in the country, Ada and Jamie are indeed the last ones picked. The “iron-faced” woman in charge takes them to the home of Susan Smith. Susan doesn’t want children. She is mourning the loss of her “very dear friend” Becky, who lived with her and kept horses. There’s still a pony named Butter out in the field, and Ada is fascinated with it. The story that follows shows us clearly how Ada’s life is saved. Susan’s and Jamie’s lives are changed along the way. Words can’t adequately describe this book and how brilliantly the story is woven. The two short chapters at the beginning prepare us for how deprived Ada is, but it’s more fully revealed as she comes out of the room and copes with the country. “Grass?” He knew about this green? There wasn’t any grass on our lane, nor nothing like it that I’d ever seen. I knew green from clothing or cabbages, not from fields. Jamie nodded. “It’s on the ground. Spikey stuff, but soft, not prickly. There’s grass in the churchyard. Round the headstones. And trees, like that over there.” He pointed out the window. Trees were tall and thin, like stalks of celery, only giant-sized. Bursts of green on top. “When were you in a churchyard?” I asked. What’s a churchyard? I might have asked next. There was no end to the things I didn’t know. Later on, it seems utterly realistic that, rather than being grateful, Ada gets frustrated and annoyed with all the things Susan tells her, full of words she doesn’t know. When Susan makes a beautiful dress for Ada for Christmas, she has a complete meltdown, unable to feel that something so nice can be for her. But most of the book is filled with little victories. Ada learns to use crutches. She learns to care for Butter. She learns how to go among people and makes friends. And the backdrop of all this is the war, which does come even to the countryside. And the looming question of what will happen when Ada has to go back? This is a beautiful book. Even though I listened to it, I’m going to keep my Advance Reader Copy, because I am going to want to treasure Ada’s story again. I’m sure I’ll notice subtle emotional cues I didn’t catch the first time. 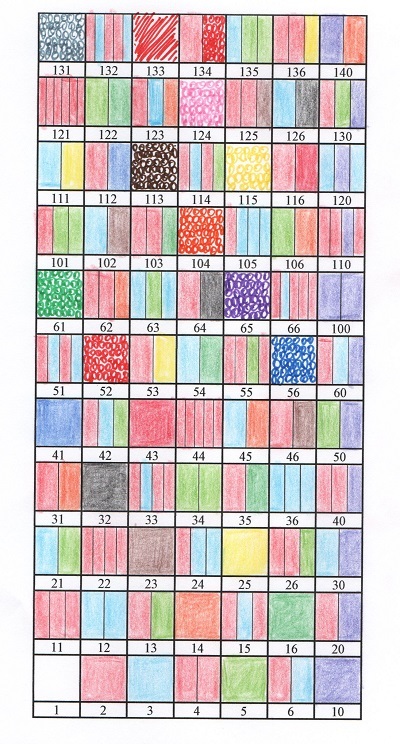 How can I tell children about this wonderful book? I may decide to play up the bombs and spies (Yes, they are both in there). This is ultimately a book about the value found in every person and how love can save your life. Houghton Mifflin Harcourt, New York, 2015. 32 pages. This is a simply lovely book that poetically shows the reader what it feels like to be an immigrant in a country where you don’t know the language. On the page where our narrator says, “Nobody spoke like I did,” we see strange shapes coming out of people’s mouths all around. under a waterfall of strange sounds. I felt like I wasn’t me anymore. of my own words and sounds. I called it my old blanket. My old blanket was warm. It was soft. It covered me all over. It made me feel safe. Sometimes I didn’t want to go out. She meets a girl in the park. Slowly a friendship develops, with shared activities. Slowly she begins to learn words of her new home. They started to sound warm and soft. I was weaving a new blanket. The new blanket grows warm and soft and comfortable as the old one. The metaphor used in this book is cozy and accessible. Readers will feel happy with the immigrant child as she finds joy in her new home. The soft pictures beautifully accompany the text, dipping into the metaphorical when the blankets are described. 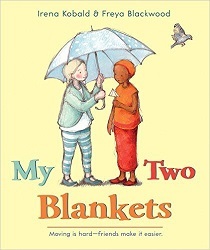 We read on the back flap that the author was inspired to write the book by a friendship that developed between her own daughter and a Sudanese child. She teaches aboriginal children in Australian outback communities who use English as their fifth language. This book is a lovely way to build bridges of understanding. Andrews McMeel Publishing, Kansas City, 2014. 151 pages. This book is a retrospective. It accompanies an exhibition at the Billy Ireland Cartoon Library & Museum. 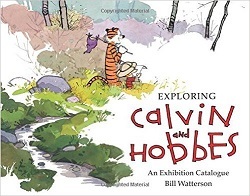 Besides a representative (and wonderful) sample of the strips, it’s got an extended interview with Bill Watterson at the front of the book, and includes some strips that influenced him as well as some examples of his early work before Calvin and Hobbes. In some ways, reading this book is less satisfying than sitting down with one of the old collections. It did make me want to sit down with one of the old collections. It gives you tastes and reminders of this wonderful strip. It brought me back to the 80s when I was a newlywed and the early 90s when I was a young mother. Both my kids read these collections over and over when growing up. My sister used to tell me when I had kids, they’d end up just like Calvin. And I have to say, if they gained some of Calvin’s curiosity and creativity and divergent thinking, who am I to say that Bill Watterson didn’t have something to do with that? It’s a magical world, Hobbes, ol’ buddy . . .
Orchard Books (Scholastic), New York, 2016. 32 pages. 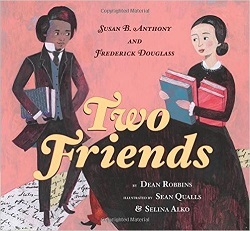 Here’s a simple picture book telling a story from history about Susan B. Anthony and Frederick Douglass. The two were friends and both lived in Rochester, New York. There’s a statue there showing the two of them having tea. This picture book dramatizes one such occasion, mostly using it as an opportunity to talk about both of their lives and how similar they were. As a girl, Susan wanted to learn what boys learned. But teachers wouldn’t let her. . . .
She read about rights in the United States. The right to live free. Why shouldn’t she have them, too? Susan taught herself to give speeches. Some people liked her ideas about rights for women. The similar language used about Frederick Douglass highlights their similarities. Frederick grew up as a slave in the South. Slaves had to do everything the master said, but Frederick wanted something more. He secretly learned to read and write. Frederick read about rights in the United States. Why shouldn’t he have them, too? Frederick escaped from his master and headed north. He taught himself to give speeches. Some people liked his ideas about rights for African Americans. Beyond this, there’s basic information about how the two supported each other and were friends. And the pictures are marvelous. A lovely introduction to the topic of equal rights for young readers. Creston Books, 2015. 40 pages. Hooray! 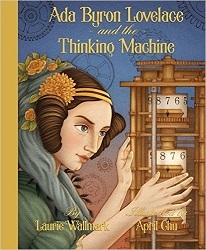 A picture book biography of Ada Lovelace, a great female mathematician, the person who wrote the first computer program. 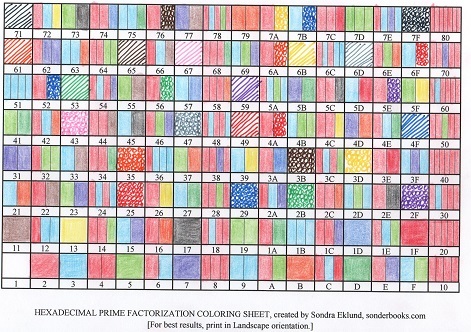 Now, for me, I preferred the graphic novel version of fact mixed with fiction found in The Thrilling Adventures of Lovelace and Babbage, but this picture book is perfect for kids, firmly establishing that women can be truly great at math and computer science. And with her mother often traveling, Ada was lonely. Her journals, filled with pages of inventions and equations, kept her company. The best part was when her sketches flew off the page and became real. The accompanying picture shows birds flying just out of reach, including a mechanical bird. This may be unfortunately misleading – it looks like the book has turned to a book about a magic, rather than a factual biography. In fact, in the rest of the book, the illustrations simply show what’s described. Okay, there’s one exception where Ada was blind for a time from her illness, and we see what she’s imagining as she sits in the corner of the picture with eyes closed. But this flight of fancy is much more clear as a flight of fancy. I came up with one other complaint. The book talks about Ada using Charles Babbage’s Difference Engine to calculate 12 times 15. The picture shows Ada looking closely at the machine with a completely different number showing. That’s a little confusing. But those are admittedly minor complaints. The author nicely explains how Ada Lovelace wrote a computer program before a computer actually existed – based simply on Charles Babbage’s plans for one. The paintings illustrating the book are gorgeous. Except for that one quibble where it’s not clear yet that the illustration is symbolic, they wonderfully accompany the story and shed light on the events, adding variety and interest. Because Babbage never finished building the Analytical Engine, Ada never got to see her program run. But the influence of her work lives on. More than one hundred years before the invention of the modern computer, Ada had glimpsed the future and had created a new profession – computer programming. Ada couldn’t know that one day a computer language would be named after her — Ada. And one of Ada’s uses? To guide modern flying machines. The girl who needed crutches ended up flying after all! You are currently browsing the Sonderbooks blog archives for April, 2016.